We are proud to say that our common sense approach to care is paying off with the Care Quality Commission. Our latest inspection sees us meet all the outcomes that were reviewed. 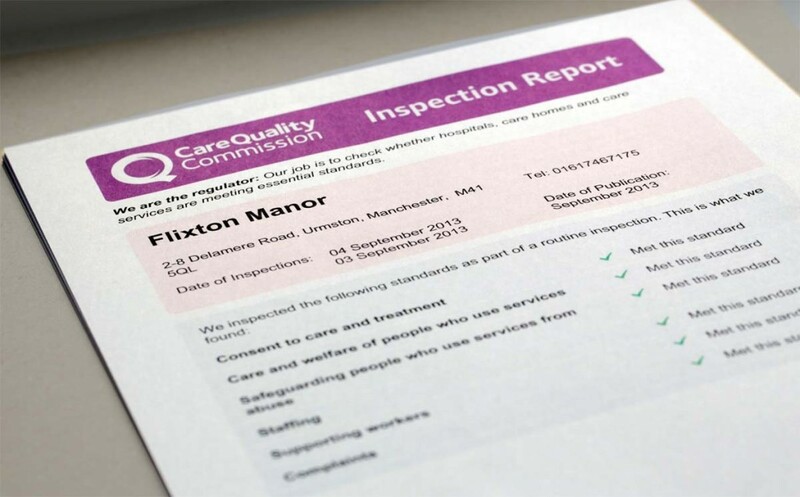 Flixton Manor is continually striving to improve standards, focusing on our residents well-being, care and comfort. Whilst we ensure that the underlying practices of our care are robust and efficient, we take a more personal and common sense approach by allowing residents and their families to tell us what matters to them. We always act on this kind of feedback and have an open door policy in which all residents, staff and family members can speak to us informally at any time. We do our best to keep an open and approachable style to our management so that any concern or suggestion can be dealt with and acted upon there and then. We ensure that there is no need for paper pushing and bureaucracy to get the job done. By staying on top of what matters most, we can keep our home running smoothly with happy families, residents and staff. Consent to care and treatment. Care and welfare of people who use the service. Safeguarding people who use the services from abuse. Our latest inspection report is available by clicking here and below are a few of the quotes mentioned in the report. The staff are very good. They always listen to me and take me seriously. Staff do things the way i like them to be done. I am very happy for what staff do for me and i know that staff will listen to me if i need anything different. I visit most days and have seen different activities going on. They also have an entertainer come in on occasions. One day they had a person in with a range of animals for residents to hold. The staff always come in to see if i am alright. I get much more attention here compared to where I was living before. I can approach the manager at any time if i need to discuss anything. She has an open door policy and will listen and respond appropriately. We work well as a team here and i enjoy my job. These are just a few of the comments from our report made to the CQC inspector and we are very proud of our staff for the amazing job that they do. We hear that the CQC are moving to a points or star based system of inspection soon. This will mean that care homes will get a rating instead of simply meeting standards. We are confident that we will be one of the homes to benefit from such a system and look forward to seeing how this new style of inspecting will work. ill get the kettle on! New website is looking great, are you still listening to dads boat stories? oh yes! he told us you used to get sick and cry your eyes out?